The Ridley Township Public Library is pleased to offer full notary services to our patrons. You will need to provide the completed documents to be notarized and a current photo ID. A Passport, driver’s license or government issued non-driver identification card which is current and unexpired. A Pennsylvania state or state related university identification card. All forms of ID must be written in English. There is a $.15/page charge for any photocopies. There is a $1/page charge for any faxing service needed. 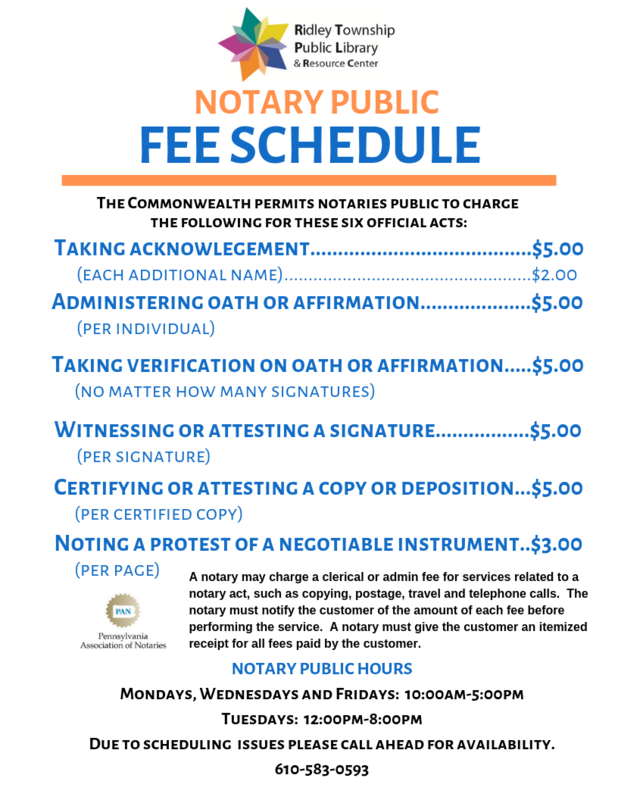 *The notary at Ridley Township Public Library is not an attorney and is not authorized to practice law, give legal advice, or prepare legal documents. Ridley Township Public Library will not notarize some documents that require additional legal knowledge. This includes explaining to the customer what to say in an affidavit or affirmation, interpreting or explaining the documents, or telling the customer what forms are used. A notary public is also not allowed to draft legal documents, such as wills, deeds, or contracts. In addition, birth certificates and marriage licenses are publicly recorded documents and certified copies cannot be made by a notary. Certified copies are only available by contacting the specific government entity issuing the document (secretary of state’s office, court of law, county clerk, or Bureau of Vital Statistics). Only documents in English can be notarized.